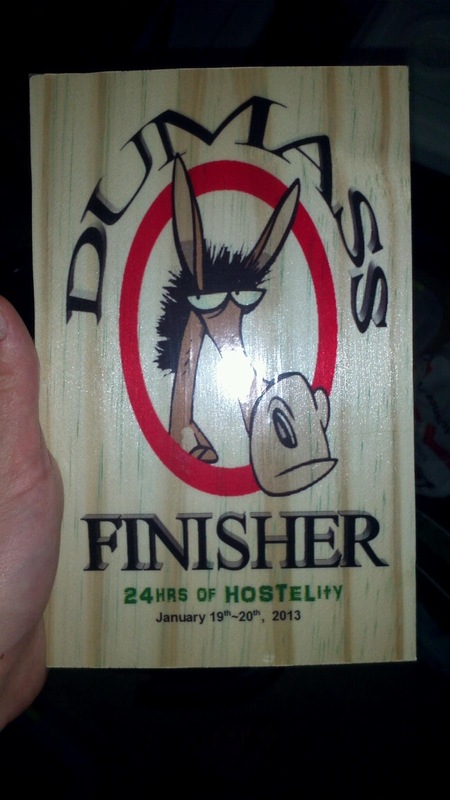 Yesterday I was fortunate enough to participate in 24hrs of HOSTELity, hosted by DUMAss Events. Knowing the course, and my goals for this year, I decided to just go out, have fun, and not get injured. With these goals in mind I was not confident from the start that I would run the full 24 hours. The race started at 9:01. Willy lead us through our first lap, then we were on our own. The course is a very hilly, 1 km loop. On a faster loop one could run it in about 7 minutes. Obviously records are not meant to be set here. With that being said, Willy did create belt buckles for anyone daring enough to hit 100 miles. The first 15 laps went by fast. I knew that my leg would give me problems soon. Before this race I had tightness above my knee and around my foot. I got a massage the day before the race, which helped me run farther than I expected. Anyway, sooner or later during the day I felt the pain come back. I couldn't run correctly. When I could "run" my downhills involved a straight left leg, a bent right leg, and some hopping. Not good for preventing injury. Luckily DUMAss events had a sports chiropractor there that knows their stuff. They helped me with some stretches. This got me going again for a few miles. I would have times when the pain was minimal and I was really able to kick it up, then there were other times when I just wanted to stop. Around noon I grabbed a beer and went around the course. Drinking and running is something I have never tried. The beer made me feel a little bloated, but I enjoyed the beer more than I disliked feeling bloated, so no worries there. More laps went by. I was off and on as far as my leg went. I popped some Ibuprofen and got into my red wine(I came prepared!). The red wine was excellent. I drank it like water for a few laps, taking sips when necessary. This did not make me feel bloated, tasted delicious, and gave me a little buzz to reduce pain. As the day went on I made friends with a few people. I used these people to make me want to walk more. For example, one friend was stopped and telling everyone she was done. I asked her just to walk a lap with me. We chatted and before we knew it the lap was over with. I set out to do another lap and about a minute later I could see her starting another. I love in these races, no matter what position you are in, you can be friend with the person in first and the person in last. Best of all, the way the course is laid out you can see a lot of the runners in different stages of the loop while running. My parents visited me and helped me with my leg. My mom let me borrow her Zensah calf compression and put in over my knee. She also stretched me out. After doing that I was able to run again! Meanwhile, Angela McVay is kicking tail out there. She was in a race with Margaret Curcio for first place. All throughout the day they are back and forth. Now it is 1.5 hours from the finish and Angela needs to make up a lap. I hook up with Angela and she is tearing it up. She must be running those 7 minute laps I was telling you about earlier. Surely nobody is out there throwing it down like she is now! On our second lap together Angela passes Margaret, putting Angela on the same lap as Margaret for the moment. Angela still has to loop around Margaret to take the lead. Angela and I kick it for a few more laps, my leg locks up on me, and I have to let her go. Walking slow again I expect Margaret to come by any time now, but she doesn't. At the end of the lap I am greeted by a friend who informs me that Margaret is done. Margaret apparently was just trying to get some training miles in. Angela comes plowing down the big hill and we tell her the news. For some reason Angela keeps kicking. I get a few more laps in and hang out next to the fire for a while. At the end of the race Angela lets me know that she won the 12 hours overall, and that if someone from the night doesn't beat her she will get first place in the event. I was so excited for her. She worked hard all day and deserved to win. On a side note, the laps have not been posted on Ultra Signup, so I don't know if she actually won or not. After Angela leaves I hang out indoors for a while and talk with some people. Candy, one of the volunteers and a killer ultra runner, made some delicious chicken orzo soup. I had to stay to enjoy that(and sober up). Finally around 10 PM I turn in my race chip and tell Willy that I am going home. He hands me a really nice plaque with the race info on it. I tried to go around and thank everyone, and if I didn't I apologize. I appreciate each and every person that helped me during the race. After taking a shower and laying in bed I had no regrets for leaving. I have a very important and expensive race coming up in a few weeks. I want to be injury free for that and maybe try to compete with some of the pros. This means over the next few weeks I will probably keep it low mileage and do a ton of stretching, maybe even some Yoga. The massage therapist I visited told me multiple times that I needed to stretch my quads out. I know with my barefoot running technique my quads do get used a lot. They deserve some attention. Anyway, thanks for reading and if you were there and you took any pictures, or wrote a blog, let me know and leave a link! I will add more photos to this blog later. I forgot about a few things I meant to mention. There was a girl there wearing Barefoot Ted's Luna Sandals. I haven't done much research on these, but they looked really well constructed and comfortable. She only did a few laps with them(as far as i know) before switching to vffs. The steep hills probably led to some sliding around. I have messaged her about them and am waiting to hear back. Jim, "Godzilla" , was a super cool guy that I met. I could hear him coming up on me. He has a distinctive breathing pattern, similar to what Dr. Nicholas Rominov teaches. Instead of deep breaths he almost pants. I am not sure if this is intentional or not. :) This coupled with his tight-leg-muscle-dowhnill-technique made me give him the nickname Godzilla. We cheered each other on all day and told each other we looked good. Excellent write up. I am glad that you were taking care of yourself. So many runners try to push through things they should not push through. You are smart to save it for a race you really want to compete in. I was waiting for dark to make my move to gain the 2 laps that I needed to win otherwise we would have kept leap frogging each other all night. I had fun running fast after dark with you behind me. I felt like we were 2 little night ninja's on a mission which kept my mind off of what it feels like to run that hard 10 hours into a run..LOL When you stopped that final lap to check the score board, I passed Margaret at the aid station for the lead. I was very surprised to learn that she stopped when I looped around that next lap. Although, she did tell me that morning she was there to get her miles in and may not even stay the full 12 hours. I continued to run an additional 10 laps running as hard as I could before the finish because I was fearing the 12 hour night folks. 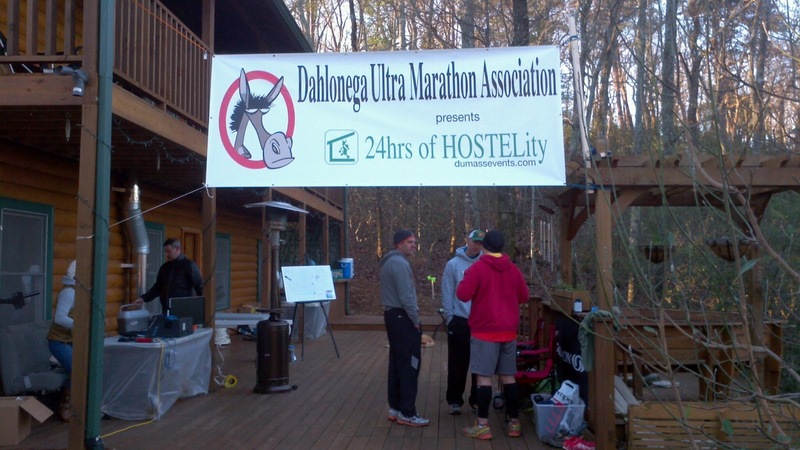 I knew there were 2 very good ultra runners running that night. With less than 2 hours left, I just wanted to hit it hard to get it done. I knew at that point I was in the lead for the ladies. IT wasn't until after the race when I spoke with you that I learned that I was first OVERALL and that it was a course record. That was a gift! Waiting till the next morning to hear the offical results was like a slow death...lol I'm so happy I pushed through the final hours of the race and fought for a strong finish with 78 loops (50.7 miles). Ronnie Hines was a close 2nd winning the male 12 hour race with 75 loops. It was a great race.